Apartment sleeps 4/5 in the ground floor of a farmhouse villa, with private garden, patio, BBQ, free parking, satellite TV and free WiFi internet. In the heart of the Maremma countryside, it is really close to Saturnia village, famous for its hot springs and its SPA/golf resort. 30 minutes driving from the Tuscany Sea with white sand beaches and crystal blue water. Alberese with its beautiful natural park as well as Porto S.Stefano (where you can take the ferry ride to Giglio Island) are only two of the special sea places to be visited. 20 mins from a swimming pool and 10 mins from Scansano village, well known for its red wine Morellino and for its special olive oil. 5 mins driving restaurants, pizzeria, supermarket, bar in the Pomonte village. Easily to reach are also other medieval villages like Pitigliano, Sorano, Sovana, Magliano, Manciano. The apartment offers beautiful views of wild region under the Tuscan sun and fantastic sunsets. My name is Mirko and I am the son of Ivo and Valeria, the owners of the farmhouse. My parents live here since a long time. In the farmhouse we produce red wine and olive oil as well as some vegetables. I am helping my parents taking care about booking together my wife, Barbara. We can speak English and a bit of French. We want that all our guests spend an unforgettable and relaxing holiday. We love this area, it is peaceful, the food is fantastic and there are a lot of nice places to visit, the sea coast can be easily reached as well as the famous Saturnia hot springs. Imagine a place where you can have a bath in a hot water all year, with natural falls behind , even in the night under the moon light and the stars shining in the dark... for free! This place exits and it is 20 min far from us. Do you like Tuscany weather, food and wine? Are you looking for a place where you can start daily trips for nice historic towns? Want to visit a lot of different sandy and rocky beaches? Or simple want to have relax with your family looking your children playing in huge garden of a farmhouse? This is the right place where enjoy all those things. Bathroom with shower, WC, bidet and window. A washing machine is always available for guests in a separated room. The living room has a full equipped kitchen, a sofa, a satellite TV and a table for up to 6 persons. Full equipped, Fridge, freezer, microwave, toaster, satellite TV, oven and cooker. The apartment is at garden level. There are dining table both in front of the apartment entry and close to the barbecue area. 18 holes golf resort at 15 minutes by car (Saturnia). Another golf site is at Fonteblanda, 30 minutes by car. Notes on accommodation: The apartment is a very suitable place for families with children and people that want to relax and eat healthy with genuine local food. The farmhouse produces olive oils and Morellino red wine as well as eggs, tomatoes, artichokes and some season fruits. Local products, meat, cheese, vegetables, are easily available in every supermarket in the zone. Outside: Garden immediately outside the apartment, with BBQ, fountain, sun beds and table with chairs. A lot of space for children. Utility Room: A washing machine is available in a separated room. Cleaning / Towels / Linen / Maid service: 1 set of towels and linen included. Cleaning and linen change at the end of the holiday are included in the price. If you book for two weeks or more weeks, the linen/towels will be change weekly while the cleaning will be only at the end of your stay. Other: Patio with table and chairs for dinners looking the fantastic sunsets. Another dining table is available in the garden. Het huis ligt in een heuvelachtige omgeving. Het primaat in de omgeving ligt bij de landbouw. De gehele beneden verdieping wordt verhuurd. De eigenaar woont er boven. Het huis is van alle gemakken voorzien, heeft 2 slaapkamers en buiten lekkere ligstoelen. Het huis was van binnen heel schoon. In Pomonte op 3 km rijden ligt een supermarkt. De kust is in 30 minuten bereikbaar, de zwavelbronnen van Saturnia in 20 minuten. Bijzonder de moeite waard zijn de plaatsjes Pitigliano, Sorano en Sovana. Deze plaatsjes zijn in 45 minuten goed te bereiken. Voor rust ben je hier op het goede adres. We stayed at the house from the 3th of july-15th of july 2016 and really enjoyed our stay! The house was perfectly clean and everything was nicely set up for our arrival. We were welcomed with fresh eggs, wine & olive oil and Valeria showed us around the property. We made several trips to different beaches, but also explored nearby villages like Pomonte, Montemerano and Pittigliano. We also enjoyed afternoons by the pool and evenings by the barbecue. The landscapes in this area are beautiful & we went out and enjoyed pizza at a local authentic restaurant. Valeria helped us out with our questions and gave us recommendations what to visit and where to go. Mirko helped us with our questions as well. In general, we always had pleasant conversations & felt welcomed. We would recommend this property to anyone who would like to explore the south tuscany and wants to stay at an authentic italian house. You'll not be disappointed by the beauty & atmosphere of the south tuscany. We had a wonderful and relaxing stay without anything missing. First of all the warmly welcome with wine, olive oil and eggs. Then we never had to hesitate to ask for more eggs or lettuce from the garden. We got any help we needed and had some nice smalltalk with Valeria. The apartement was well equipped and very clean. So was the pool, which especially was used by our son. The surrounding is wonderful and you can reach a lot of interesting things to visit by a short drive. We espacially enjoyed the hot springs of Saturnia and the Parco dei Tarocchi (!!!!!) which everyone should visit espacially with kids. A supermarket where you can buy everything you need is in Pomonte, 10 minutes to drive as well as a nice Restaurant (Antica Maremma) where you can get typical italian food and pizza. So thank you very much for a wonderful and relaxing holiday! We enjoyed our stay in your beautiful and quite home. The house owner were very friendly and helpful. The appartment was very clean. We fell in love with the house cat and the chicken. The whole family enjoyed the stay. Thanks a lot for all. 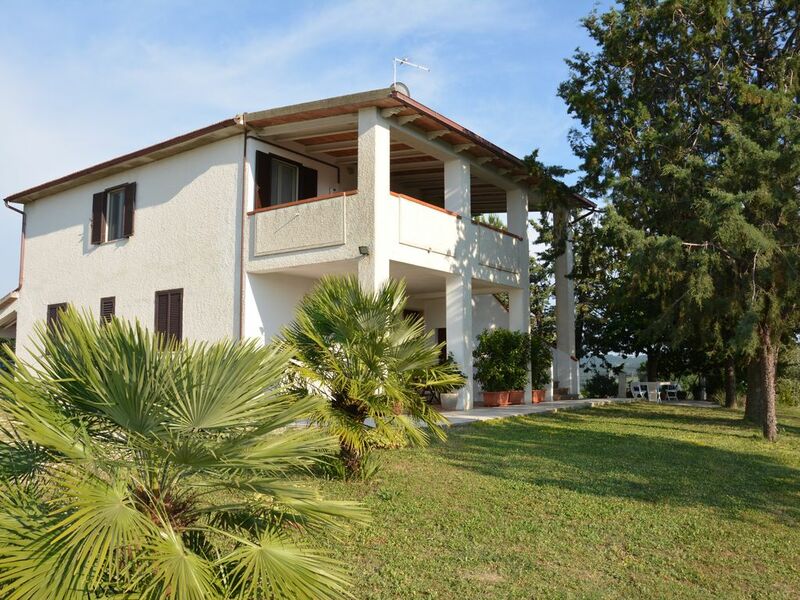 Aquilaia was a lovely apartment in which to relax in beautiful countryside after the hectic pace of Rome. Our hosts were there if needed and the welcome gift of oil, wine and eggs was thoughtful and much appreciated. Situated in an ideal spot for exploring both coast and inland, I can see myself returning and recommending to friends. Great property for relaxing, outdoor dining and getting away from it all. 2+2 family lots of space, comfy beds and even decent wifi. Very traditional interior but used outdoors as much as indoors. Only 30 minutes to beautiful beaches, hot springs or mountain villages. We are very happy you spent a good time here. Rome Airport 180km (about 2 hours driving). Pisa Airport 180km (about 2 hours driving). Car hire is recommended. Alternatively: train and bus. The closest train station is Albinia (20 min far). Many interesting places can be easily reached. The Maremma national park is 30 mins drive and Saturnia's hot springs 30mins drive. Rome 180km. Pisa 180km. Florence 180km. Siena 110km. Grosseto 40km. Scansano 13km. Magliano 30km. Saturnia 17km. Pitigliano 30km. At about 3 Km there is the Pomonte village where you can find bar, restaturant/pizzeria and a supermarket where you can find local and genuine produits. In Scansano you can find all the amenities (banks, chemist, shops, pizzeria, restaurants, etc).